The kids and I do a fair amount of crafting together and one of the questions I get asked most often by friends and blog readers is how I organize the kids craft supplies. We don’t have a fancy system, just some stackable plastic drawers where all the kids craft supplies are kept in a closet in our office/craft room. If it doesn’t fit in these drawers, we don’t keep it + we don’t buy more supplies until there’s room in the drawers to store them. This helps keep the clutter to a minimum and helps motivate us to use up what we have! This quick insta-video gives you a peek at my craft space along with the storage drawers for the kids supplies. As with any organizational system I’ve tried to put in place, it’s the simplest ones that seem to stick. 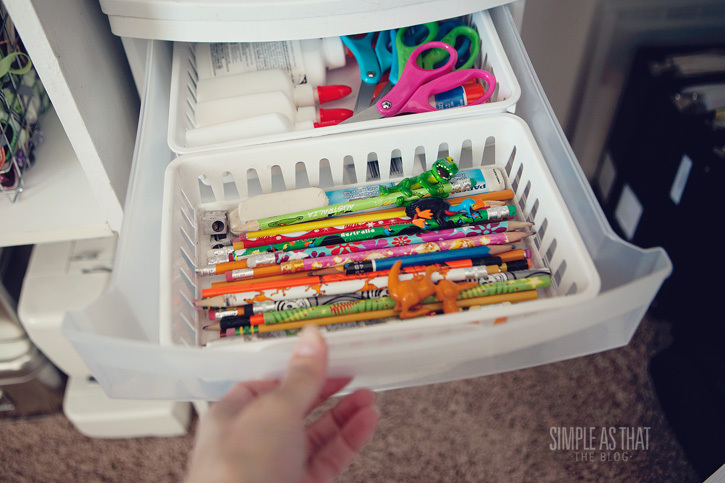 I feel like our crafty stash organization is as simple as it gets. The drawers are clearly labelled and some have removable containers to help keep things in place and to make it easy to take out a certain set of supplies for a particular craft project. The kids know where to find things + exactly where to put things back when they’re done with them. We have a drawer for stamps + ink, one for paint + paint supplies, one for misc. craft goodies like foam shapes, feathers, pipe cleaners etc. We also have a drawer for papers, one for pencils/erasers/glue/scissors, one for crayons/markers/pencil crayons and one for stickers. One thing I’ve found that is really handy for storing supplies inside our craft drawers are these plastic 4×6 photo containers. They’re the perfect size for crayons, pip squeak markers and other miscellaneous supplies. I use them on the go for taking crayons to church or in the car and also to store card games. 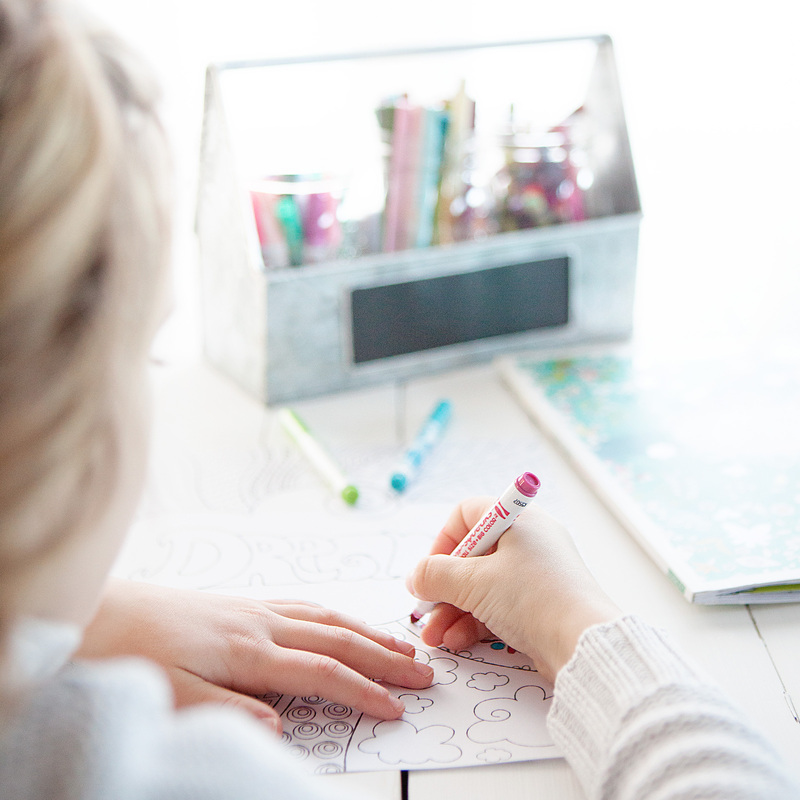 I really love these containers – they make it simple and easy to grab things when the kids want to sit and color for a few minutes. **ETA if the link to the photo containers above is out of stock I found some here as well. If you’re in Canada you may be able to find similar containers at your local Dollarama. Most of our family crafting takes place at the kitchen table, but in my craft room we also have a small child’s ikea table with two chairs where the kids can color, paint, etc. It’s such a nice addition to our craft room and it allows me to get things done while my kids are getting creative. They’re right with me and we can chat and interact together as we work. Don’t forget that now is the best time of year to stock up on all those kids crafting essentials like gluesticks, markers, crayons, construction paper, etc while the prices are cheap! 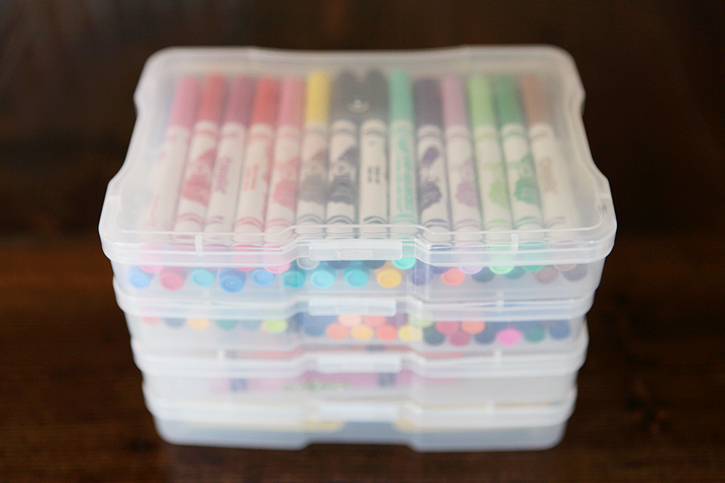 Our craft drawers are all restocked and we can’t wait to get crafting this new school year! You can check out some of our craft projects through the years here. This is wonderful!!! I have those same drawers too. What a fabulous idea with the baskets!!!! I can not wait to do this. I just love your blog & you have such a beautiful family! Michaels sells those containers too. Almost always on sale for 1.49. Great post! 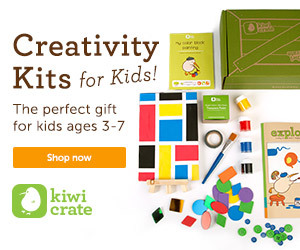 The kids craft stash?!?! I need that for mine too! 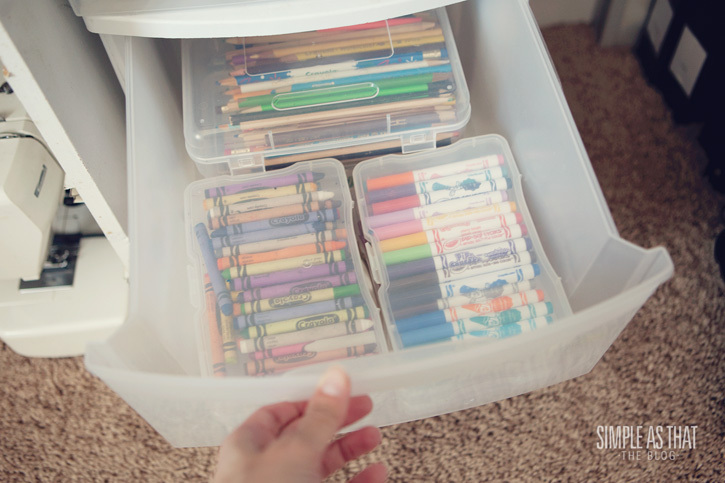 I love it that I could do this for my grands and my daughter will think I am “all smart and organized” Thank you for that By the way! 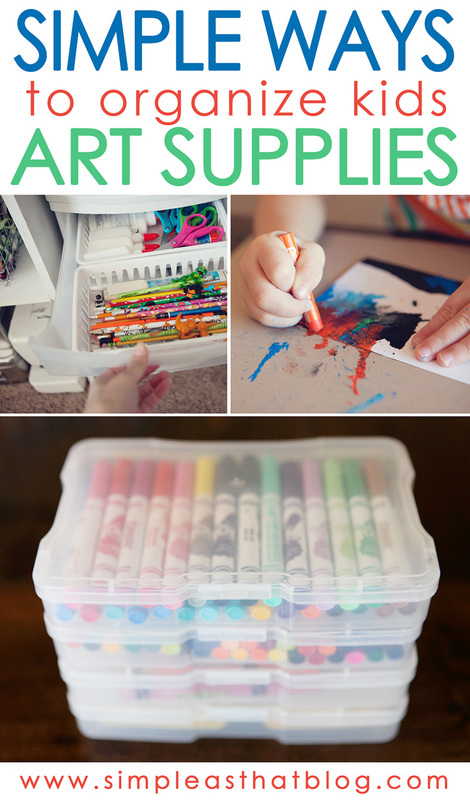 It’s such a challenge to keep the art supplies organized, great post! Love this! Our drawers are such a mess, so I’m glad to know those containers are a perfect fit! Great inspiration! Stumbled on this post via Pinterest and was totally inspired to purge and re-arrange my scrap room yesterday to make space for a kids table and their art supplies! Super happy with how it turned out – and surprised that it’s actually LESS cluttered despite adding their things! I’ll be stopping by your page more often in future! Stumbled on this post via Pintetest and was inspired yesterday to purge and re-organize my scrap room to make room for a kids table and their art supplies! Thanks 🙂 I’m now looking forward to time spent creating in the same space! Love this.. we are actually in the middle of a move and I will have a crafty room..and will be sharing it with my littles ones (5& 2) and have a 8 drawer rolly cart that I was thinking of making their own. Perfect!!! Thank you for these simple tips. I’m sharing on K12’s Pinterest so that others may take advantage of your great organization ideas! Iris has a version that’s 6 boxes, plus a bigger box that they all fit into, for $9.99+tax. If you have Amazon Prime, there is a free shipping version. It’s a great deal.